For years, you've been stopping in the tiny town of West. And all along you've been doing it wrong. Say I agreed to never eat another kolache, starting now and continuing for the rest of my life. I don’t know why I’d do that—Was my son kidnapped? Was I?—but let’s say I did. No more of the delicious Czech pastries for me. Even under such a cruel and unusual arrangement, I would still have eaten more kolaches than the average person ever will, and it wouldn’t be particularly close. 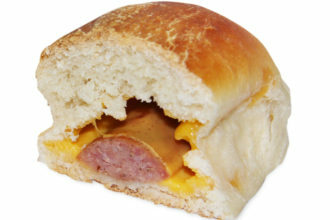 This Is Not a Kolache: Some might call it a “sausage kolache.” Big-city bakeries might simply label it as a “kolache.” But it is actually a klobasnek (plural: klobasniki). If you stop in West and order a dozen kolaches, just know you’re not getting this. You’ll get fruit-filled pastries. They’re better, anyway. Same goes for klobasniki—incorrectly, but persistently, called sausage kolaches by most—and just about anything else you can find if you pull off the highway at Exit 353 and hit one of the bakeries or convenience stores in West, Texas, a tiny enclave mostly built by Czech immigrants. Hot chubbies, pecan rolls, a ring bologna that I haven’t tasted in more than a decade but probably won’t ever leave my sense memory, with a flavor profile and texture I’ve never found anywhere else. Only recently did I actually start taking Exit 353 so I could stop at the Czech Stop and Little Czech Bakery (if I were headed back to Dallas) or Slovacek’s (if I were on my way to Austin or to Waco to visit my parents), just like any other road tripper. But that was because, until not too long ago, I didn’t really have to. I lived in West for 20 years, and my parents lived there for another decade or so. I didn’t have to stop, because I was already there. 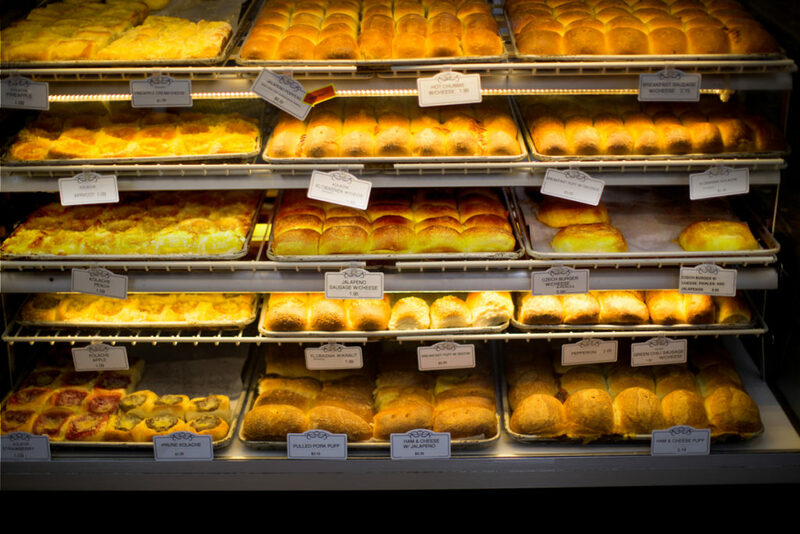 Rack ’em Up: The glass-front bakery case at Czech Stop, with its trays of kolaches and klobasniki, has long been irresistible to road trippers and their Instagram accounts. You might make a point to swing by Czech Stop every time you pass through. But I used to go there three or four times—maybe more; probably more—on a slow weekend. Kolaches and klobasniki and their various iterations and offshoots and everything else were not a roadside treat for me. They were a normal breakfast, a nighttime snack, a hangover cure, a regular dessert. So, yeah, even if I were to swear them off forever—Oh, man, am I dying?—you’re never catching up to me. As such, I have a fair amount of wisdom to impart regarding Exit 353 and its environs, and I have done my best to do so, sliding into DMs on Instagram or Twitter whenever I see a friend or acquaintance post a shot of Czech Stop’s familiar cartoon chef-and-dancer logo or the racks on racks of kolaches in the store’s glass-front bakery case. What I’ve tried to explain to them is what I’m telling you now: if you only go to Czech Stop, you’re not doing it wrong. But you could be doing it better. There’s more to West and its famous road-trip food than what you’ll find at Czech Stop. Let me tell you. Gerik’s Ole Czech Bakery was founded in the 1970s as Nors Bakery and has remained a fixture on Oak Street since then, even as it has changed owners and downsized slightly. 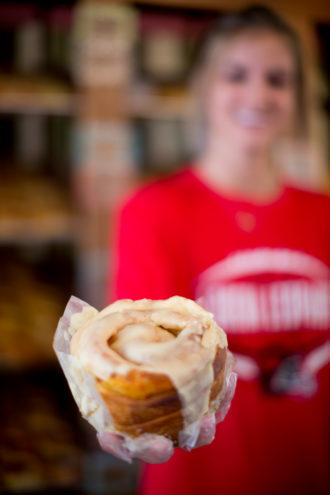 And its offerings are better than ever, with this softball-size cinnamon roll on the menu. Before we go on, I’m not suggesting you shouldn’t go to Czech Stop or its sister, Little Czech Bakery. (They both serve the same kolaches and baked goods.) If you ignore everything I say from here on out and just keep doing what you’ve been doing, that is totally, absolutely fine. You won’t be disappointed. I’ve been going to Czech Stop since it opened in 1983, back when it was known more as a homegrown 7-Eleven—with its knockoff Big Gulps, known as Big Czechs—than anything else. Kids used to get a coupon for a free Big Czech for winning baseball games. The bakery was secondary at first; everyone in town went to one of the other three that were around then. They’d hit Czech Stop in a pinch. Even when I started going there for their pastries on a more regular basis, I’d generally get something with a little less heritage to it, and definitely on the savory side: hot chubbies (klobasniki made with spicy sausage and sometimes cheese), maybe, or a ham and cheese puff (more or less what it sounds like). It’s a move I’d still recommend. If you must have something sweet, I was recently alerted that they’ve started carrying a Nutella kolache, so perhaps consider that. Its kolaches are solid—I’d call them workmanlike, not unkindly—but I prefer more of a stunt order there. Better traditional kolaches, made with apricot and peach, cherry and poppy seed, prune and cottage cheese, can be found elsewhere. For decades, until Slovacek’s opened on the other side of the highway, Czech Stop didn’t have much competition, despite the fact that, for much of that time, there were three other bakeries in town. There was a short period when another gas station a bit farther up the frontage road, looming above Czech Stop on a hill, had an ingenious strategy to siphon off some of its word-of-mouth business by advertising itself with a sign that said “That Czech Bakery,” a blatant attempt at confusion. And though it did offer a small selection of kolaches, no one who knew would ever confuse the two. The sign is gone now, I assume, because Czech Stop didn’t take too kindly to it. Czech Stop’s real competitors didn’t hug the highway, and so were less obvious to passersby. Those were the ones the locals went to. Those were the ones my family went to. But it’s not like they were (or are) hidden, or even that far away. Gerik’s Ole Czech Bakery is two blocks away, just up Oak Street. Gerik’s began its life as Nors Bakery in the 1970s, not long after I began mine. My grandfather Ben and his brother (whom everyone called Tony, even though neither his first nor middle name was Anthony) met a bunch of other old-timers there most mornings for coffee and pecan rolls. I’d get to sit at their table whenever my mom would send me in for a mixed dozen—usually heavy on cheese kolaches—listening to them banter in Czech. Its kitchen was staffed by little old ladies with graying perms and octagonal glasses who turned out trays of kolaches from passed-down family recipes. The business changed hands in the ’80s, and a (since-closed) smokehouse took over a big chunk of the building, but the spirit remains. The biggest difference is the bakery now offers a giant, very good, if not entirely traditional cinnamon roll. This is where I send people who ask me where to go and where I take newcomers. It remains, to me, the closest portal to the West in which I grew up. 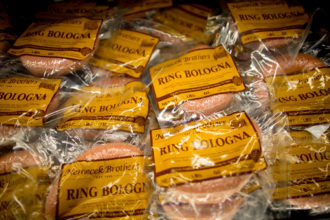 When Slovacek’s came to West, it brought back Nemecek Bros. Meat Market’s signature ring bologna. Others may argue that feeling comes from another place farther up Oak Street, a block past the railroad tracks in downtown West, and it would be difficult to suggest otherwise. Village Bakery very much prides itself as being a keeper of Czech tradition. It’s the oldest in town, founded in the 1950s, and claims to have invented klobasniki (or the American versions, at any rate). After Czech Stop, Village Bakery has gotten the most press and attention. Gourmet said “a really good kolache feels and tastes like a breakfast treat that has gone to charm school” in March 2009 after writers Jane and Michael Stern visited the store. Now, this is where it gets a bit complicated, and my deep roots in West work against me. I can’t actually tell you to go to Village Bakery. Which is to say: I won’t. Without getting too much into it, my family and the founders of Village, the Montgomerys, are on the outs, and have been for decades. It involves the late patriarch, a contested will, and a long, exhausting legal battle. You weren’t involved in any of that, of course, so I will say this: it exists, there is usually not much of a wait, parking is convenient, and many locals swear by it, which is better than any Yelp review or even a nod from Gourmet. Before The Troubles, it was definitely a regular in my family’s rotation, too. I didn’t say any of that, and you can’t prove I did. All that said, however, here is something strange: if you’re looking for the deepest connection to West’s history, you won’t find it at Gerik’s or Village or Czech Stop, and you won’t find it in a kolache. It is at the newest place in town, Slovacek’s. Slovacek’s seems as though it 1) is local and 2) has always been around (“Since 1957” it says under the nuzzling pigs on its sign), but neither is the case. John Slovacek started his Slovacek Sausage Company in Snook (near College Station) in 1957. Tim Rabroker and his family bought the outfit in 1995 and opened Slovacek’s in West in November 2013. 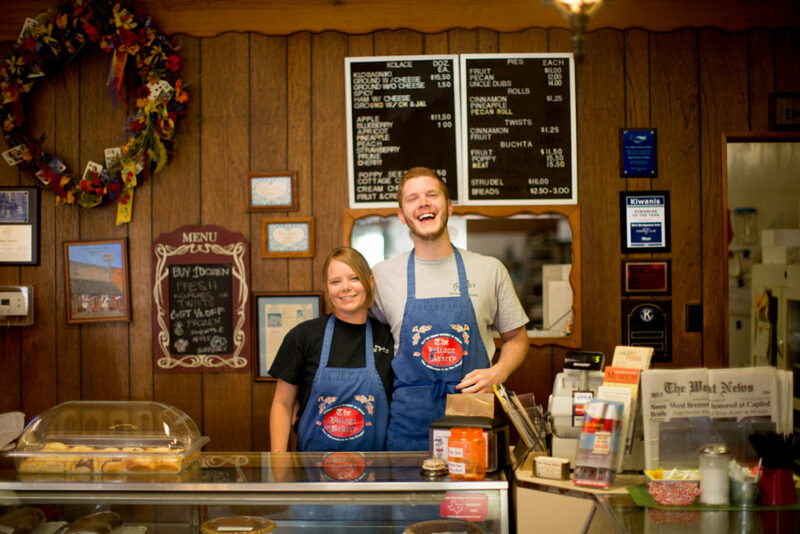 Jackie Liles and Seth Wolske work at the Village Bakery, which has been in downtown West since the 1950s. Other than being the oldest bakery in town, Village’s claim to fame is inventing klobasniki. But it is connected to the city, and not just by location. Rabroker’s uncle, Monsignor Ed Karasek, was the pastor at St. Mary’s Church of the Assumption for a couple of decades, a big mustachioed bear of a priest who intimidated everyone at the high school gym with the weight he was throwing around. 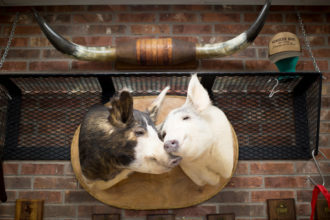 More pertinently, in 2012, the Rabrokers bought Nemecek Bros. Meat Market, which had been operating in downtown West since 1896 and had recently closed. The meat market didn’t re-open, but its sausages and ring bologna are now available at Slovacek’s. The store is somewhat of a Czech-themed Buc-ee’s, giant and pristine with a dog park, gift shop, cafe, and enough bathrooms for a tour group. Maybe a couple of them. It’s a far cry from Czech Stop’s cramped confines and baked-in atmosphere, stained by cigarette smoke and layered with 8x10s from touring bands. Slovacek’s has a bakery, too, naturally, and, like Czech Stop, its offerings are just fine. If you only stop there, you will not be disappointed. But the real draw is the meat market and its Nemecek-recipe sausages. While Slovacek’s has encroached on Czech Stop’s dominance, I see them—and Gerik’s and Village—less as competitors and more as a series of complementary parts, and I’m not alone.